or talking to his master in the after life? The old 78 goes round and round and round. Nipper the dog was born in Bristol in Gloucester, England in 1884 and so named because of his tendency to nip the backs of visitors' legs. When his first master Mark Barraud died destitute in Bristol in 1887, Nipper was taken to Liverpool in Lancashire, England by Mark's younger brother Francis, a painter. In Liverpool Nipper discovered the Phonograph, a cylinder recording and playing machine and Francis Barraud "often noticed how puzzled he was to make out where the voice came from". This scene must have been indelibly printed in Barraud's brain, for it was three years after Nipper died that he committed it to canvas. Nipper died in September 1895, having returned from Liverpool to live with Mark Barraud's widow in Kingston-upon-Thames in Surrey, England. Though not a thoroughbred, Nipper had plenty of bull terrier in him; he never hesitated to take on another dog in a fight, loved chasing rats and had a fondness for the pheasants in Richmond Park! 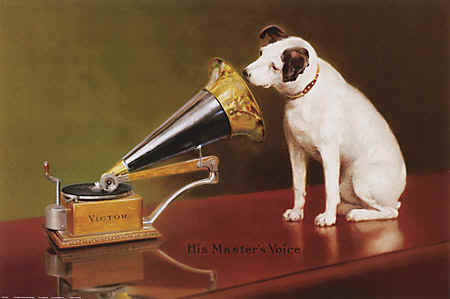 In 1898 Barraud completed the painting and registered it on 11 February 1899 as "Dog looking at and listening to a Phonograph". I was told by the manager of "Forbidden Planet" (sci-fi shop in Bold street) that this painting was done in a studio above the shop...Sounds feasable to me after reading this. Thanks for that interesting bit of information, Klaatu! Sounds possible to me too. Thanks, naked lilac. I think the Liverpool connection is especially interesting since, as you say, Nipper was a symbol that went around the world. I am still collecting information so if anyone has anything please do get in touch! Good luck to you with your continued research and the upcoming exhibition. Unfortunately I am unlikely to be able to see it as I live in the U.S. and was just in Liverpool May 15-21 so I shan't be coming back for a while. I would though be interested in anything else specific you find out to confirm that the painting was done on Bold Street as you believe was the case.